The Faculty of Arts and Sciences holds monthly meetings at University Hall. 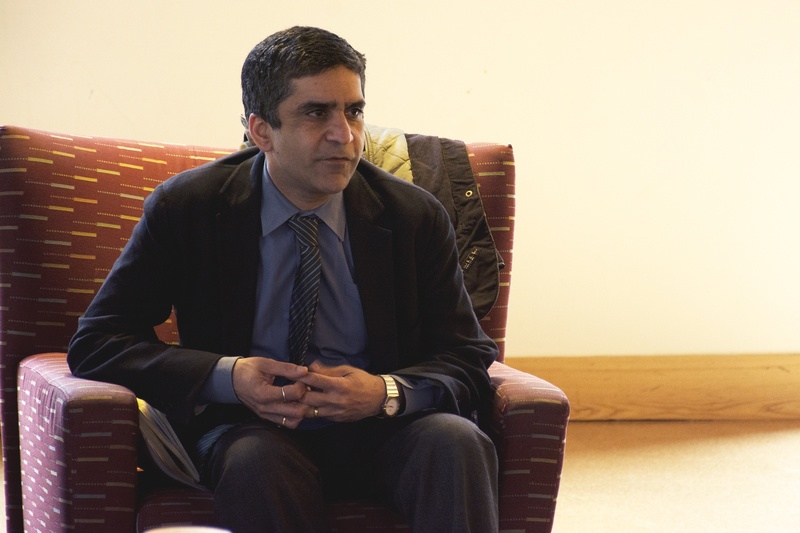 Dean of the College Rakesh Khurana will co-lead the faculty committee tasked with reevaluating the single-gender social group policy he originally spearheaded, Dean of the Faculty of Arts and Sciences Michael D. Smith announced an email to faculty members Tuesday. Music professor Suzannah Clark will co-chair the committee, which is currently comprised of 19 total faculty and administrators and will add student members “in the coming days,” according to Smith’s email. Smith said at Tuesday’s faculty meeting that the committee hopes to present its recommendations by the beginning of the fall semester, as the first class affected by the policy arrives on campus. Starting with the class of 2021, the controversial policy bars members of unrecognized single-gender social organizations from holding leadership positions in clubs or varsity teams and being recommended for a number of postgraduate fellowships. The committee was created in the wake of intense faculty pushback to the policy; some professors, led by former Dean of the College Harry R. Lewis '68, sought to overturn it. Psychology professor Jason P. Mitchell, a signatory of a motion that aimed to overturn the penalties, will serve on the committee, though none of his 11 co-signatories will join him. Lewis, declined to comment on the committee’s composition at Tuesday’s Faculty meeting. Lewis withdrew his motion shortly after Khurana announced the formation of the faculty committee. Khurana announced the new committee after months of heated debate among Faculty members at meetings in the fall. In those meetings, some professors criticized College administrators for what they argued was a lack of faculty consultation prior to the policy's rollout. According to Smith’s email, the faculty committee will be charged with familiarizing itself with the current social group policy and proposing “changes or expansions” to them. “Further input from the faculty may strengthen our commitment to this approach or may yet uncover other approaches that are equally or even more effective at achieving our stated objectives,” Smith wrote. The faculty committee will have dedicated legal counsel in University attorney Ara Gershengorn. At least one single-gender final club, the Fly, has retained legal counsel and has not ruled out filing suit against the University over the policy. In January, after the committee was announced, Faust said she wanted to ensure that the final policy is legal. “Ultimately, I want to be able to ensure that this policy is not going to get us sued instantly, is legal, is something that the governing boards feel is acceptable to implement,” Faust said in January. In its report, the implementation committee also expressed frustration with the announcement of the faculty committee while they were completing their work. 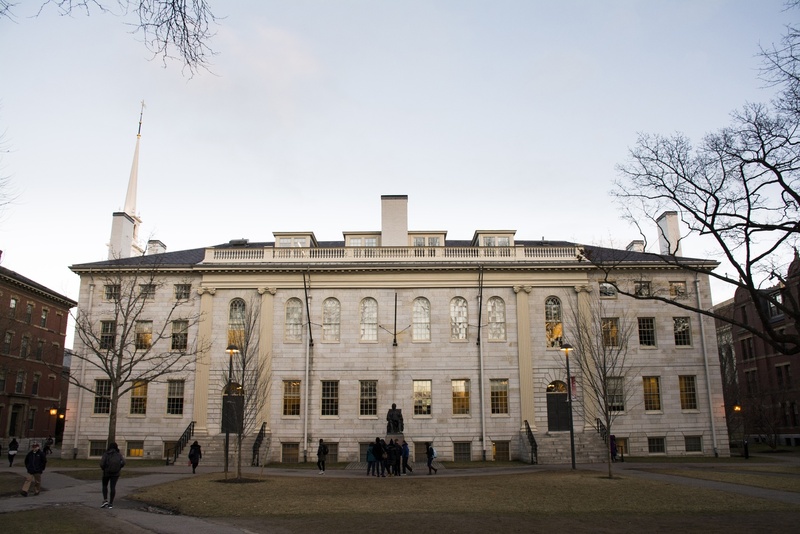 Pulling from multiple sectors of the University, faculty and staff membership includes Director of Harvard University Health Services Paul J. Barreira, Associate Director of Athletics Nathan T. Fry, and Dean of Students Katherine G. O’Dair. Associate Dean of Student Life David R. Friedrich, who was involved in meetings between administrators and final club graduate boards before the policy was announced, will serve as staff for the committee. “With a recent focus that we’ve had across our faculty on this topic, there is quite a bit of material to aid their deliberations,” Smith said at Tuesday's meeting. 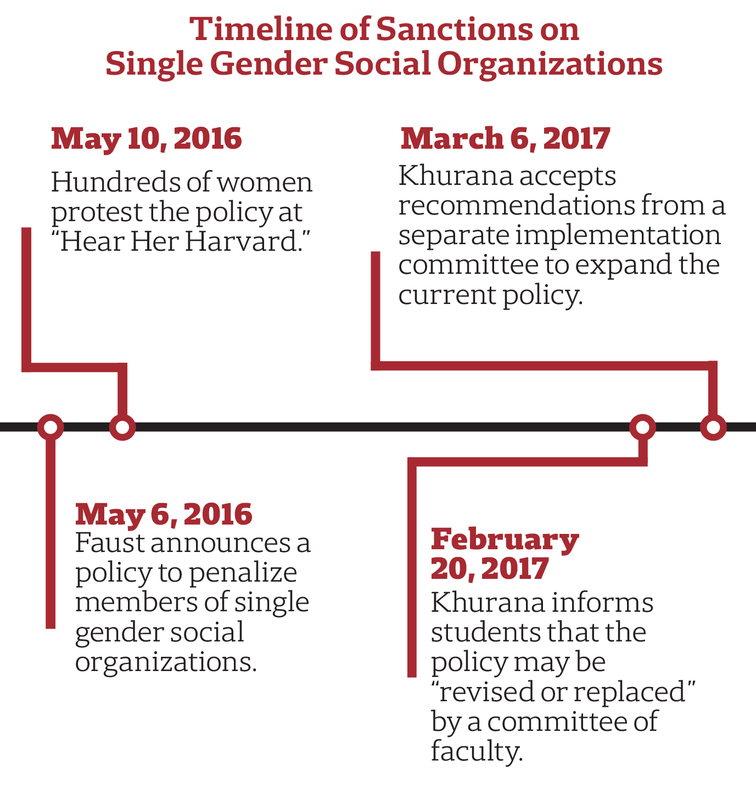 Dean of the College Rakesh Khurana will co-chair a faculty committee reconsidering penalties on members of single-gender social groups. Should the committee decide to amend or reverse the current social group policy, University President Drew G. Faust must approve the recommended changes. In announcing the committee, Khurana wrote that the Faculty at large will have the opportunity to comment on the committee’s proposals as well. –Staff writer Mia C. Karr can be reached at mia.karr@thecrimson.com. Follow her on Twitter @miackarr.